Sheet pan meals are all the rave and this one is no exception! 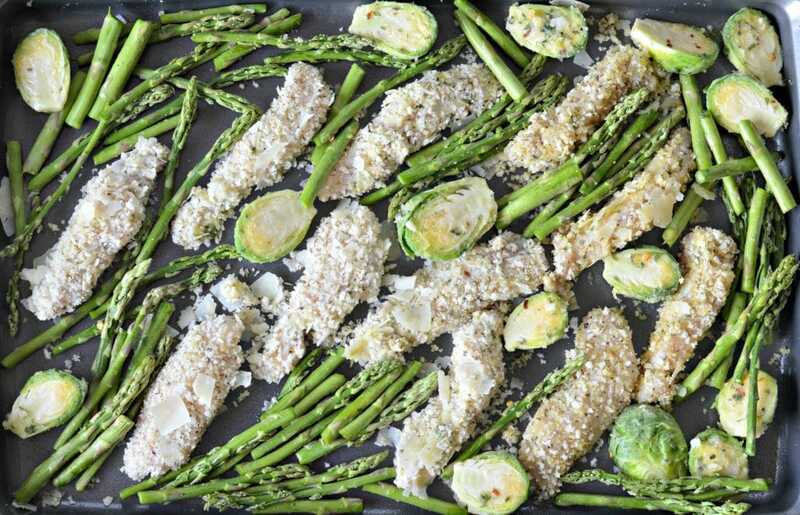 Keep reading below to find out how to make this delicious sheet pan lemon garlic chicken – I am confident it will become a family favorite! It is time for another sheet pan meal – it is so delicious and easy to clean! If you haven’t tried our last sheet pan meal, the sheet pan flank steak with garlic roasted potatoes, you can find it here. You will definitely love it. 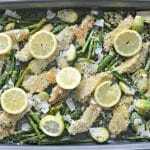 Today’s recipe is for sheet pan lemon garlic chicken and it is served with garlic and Parmesan asparagus and Brussels sprouts, and it is amazing too. Not only does it taste great, but you will love the quick cleanup. Let’s get to it! This simple, yet delicious sheet pan lemon garlic chicken recipe is ideal for the whole family. The smaller portions of chicken make it easy for your kids to serve themselves just what they are going to eat. Lately, I have been obsessed with this recipe because the flavors are out of this world and the touch of lemon combined with Parmesan cheese and garlic will leave you wanting more. My husband and I decided to start eating a bit more healthy recently, and this is one of the recipes that I came up with to help with that. 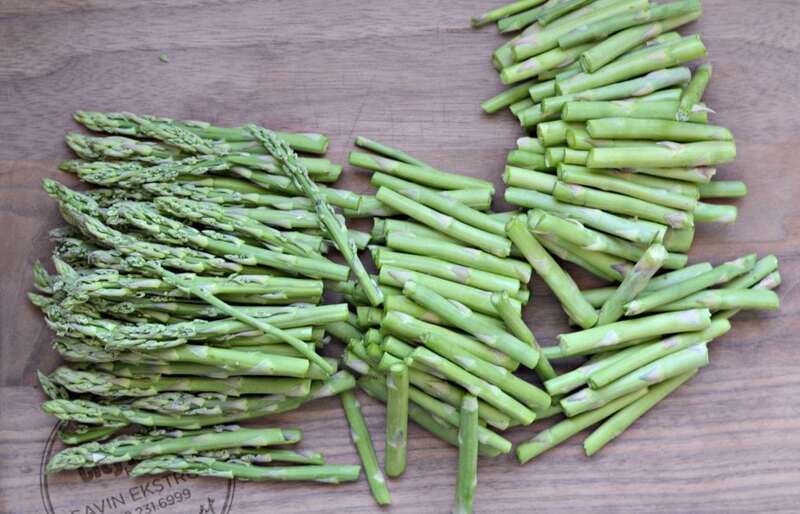 I decided to include more vegetables, including some that my husband hasn’t always been a huge fan of – like Brussels sprouts and asparagus. Now, after trying this recipe, both of these are some of our favorites when prepared this way! I was able to get some great flavors into the Brussels sprouts by combine fresh garlic, butter, salt, pepper, honey, and a hint of red chili pepper flakes. The lemony hints from the chicken combined with the stronger flavors in the Brussels sprouts and asparagus make for a very balanced flavor. Trust me – your kitchen will smell amazing as you are making this meal. The best part about sheet pan lemon garlic chicken is that it is so easy to make and the steps are easy to follow. The crunchy texture of the chicken comes from the coats of bread crumbs, butter with garlic, lemon juice and parsley, and Parmesan cheese. I chose to cut the pieces of chicken into smaller pieces of roughly the same size so that they cook evenly, and it turned out great. I decided to bake these too instead of frying them first which makes them a bit more healthy. This sheet pan lemon garlic chicken is a perfect meal for busy weekdays, picnics, or really to eat anytime with your family. The combination of crunch, citrus, juiciness, and amazing flavor will make this the star at any get together. 2 pounds of boneless skinless chicken breasts, cut into small strips. salt pepper, and red chili pepper flakes (optional) to taste. Season the chicken with salt, pepper, cumin, and two of the cloves of garlic. Set up a station of three bowls. In the first bowl, add flour, salt, and dry parsley. 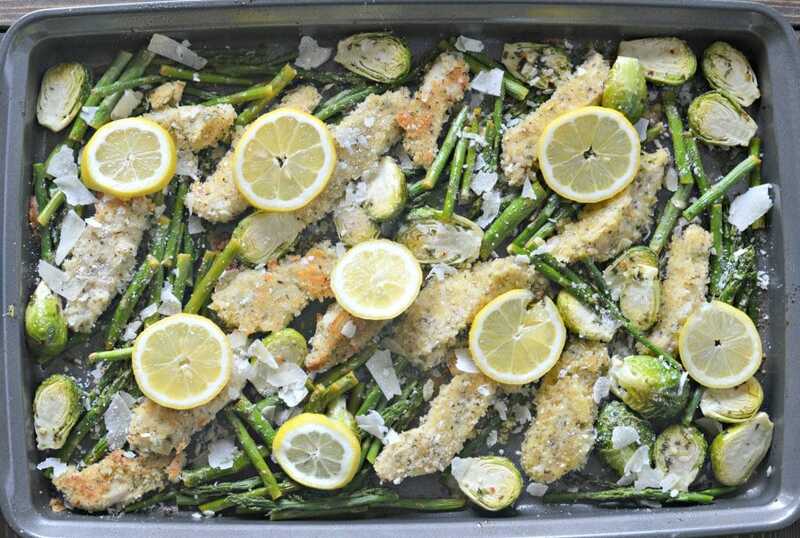 In the second bowl, combine the bread crumbs, 1 cup of Parmesan cheese, Italian seasoning, and lemon pepper seasoning and mix well. In the third bowl, add the lemon juice, melted butter, olive oil, 1 clove of garlic, red pepper chili flakes (optional), salt, and pepper. Set aside half of this mixture in a separate bowl. 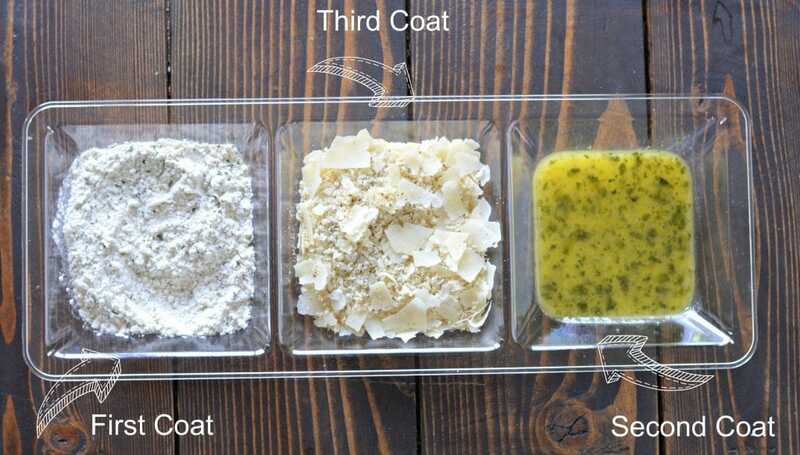 First coat the chicken in the bowl of flour, next in the bowl with the lemon juice combination, and third in the bowl with the bread crumbs and Parmesan cheese. Place on the sheet pan. 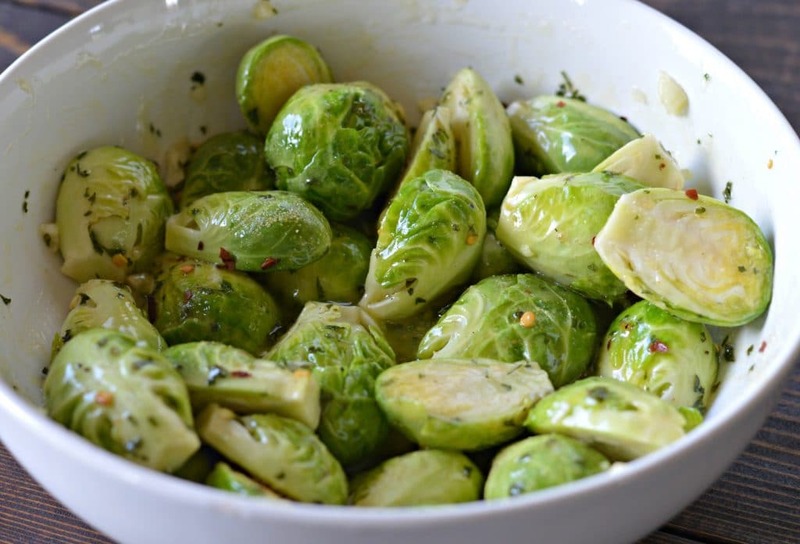 Add the honey and red to the bowl of the lemon and butter mixture that you set aside earlier and mix well before adding to a bowl with the Brussels sprouts and asparagus to season them. Set aside what is left of the lemon and butter mixture. Add to the pan with the chicken. Bake for 7-10 minutes before flipping the chicken. 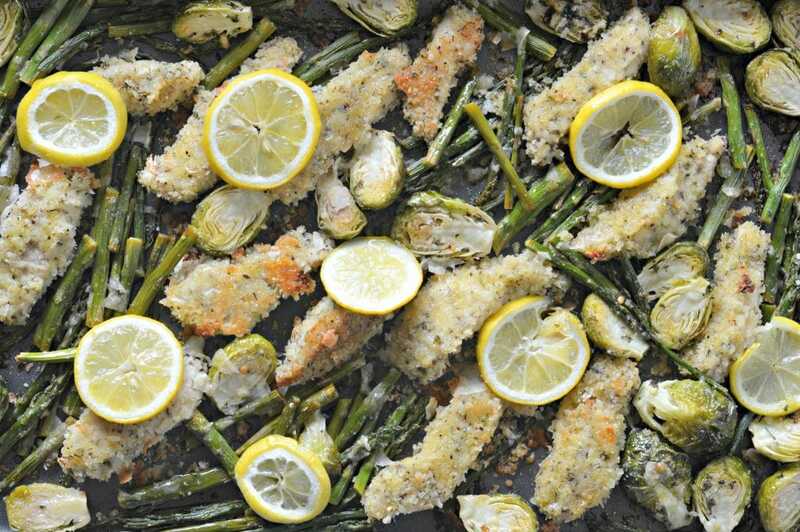 Add additional Parmesan cheese on top and place the slices of lemon on different parts of the sheet pan. Bake for an additional 10 minutes. Remove from the oven and brush with the remaining lemon and butter mixture.